Back in 2007, I started a website. This website was a personal diary of sorts, and I called it MapleMoney. Because I was born in January (and obviously super creative when it comes to domain names, ha!). That blog was tiny. I had a small handful of people visit every day, but that was it. I was not monetizing the site at all – I simply wrote because I liked to write. A few years after launching MapleMoney.com, I got more involved with couponing. I would often post my shopping trips on the blog, and people would email me or leave comments, asking me how I did it. So, I started to talk more and more about couponing on the blog. People loved it! My traffic grew from a mere 20-30 visitors per day to over 500 people per day. By 2010, about a year after I started to write about couponing more often, I hit 1,000 visitors per day. The first ever MapleMoney logo and slogan. I loved that girl! I kept blogging. I kept commenting on other blogs. I kept talking to and building relationships with other entrepreneurs. And every day, the site grew. Just a little bit at a time. While I was blogging, I was also throwing myself into all kinds of monetization strategies that I could apply to the blog. It was becoming a lot more work for me to do, and it was taking up so much of my time, that I just couldn’t justify doing it anymore, if I wasn’t being paid for the time and effort I put into my articles. So I researched. I read countless books and blog posts about making money blogging. I looked at what other bloggers were doing and tried to think of ways to do something similar. I just dove right in and started trying different things to see what worked. After a bit of time, money started to come in. At first, it was a measly $15 per month. Then $50. Then $100. Then $200. The income just grew and grew, but it grew slowly. My first ever blogging conference. I was a nervous wreck, but in the end, I had a blast! Eventually, I started to see some potential. I finally believed that I could do this. I could make this blog successful and provide for my family well. Around 2011, after lots of time spent creating content for my readers, MapleMoney.com was averaging around 6,000 unique visitors every single day. I kept writing. I kept researching. I kept learning. I stayed focused on my goal to provide a stable full-time income blogging. By the beginning of 2012, I was making a full-time income from the blog. I was so excited! By this point, I had also learned just how hard it was to run a blog. It was a ton of work and took a ton of my time. So I hired some help. At first, it was just a designer. Then someone to help me with blogging. Then a programmer. And during this time, some readers chose to bash me for these decisions. They didn’t like the fact that I was earning “so much” money from the blog that I could afford to pay people to work on it with me. What they didn’t see, was that behind the screen, I was a complete mess. Overwhelmed, exhausted, and worst of all, neglecting my family and myself. Something had to change. I am fortunate enough that, with this income this blog generates, I can afford to pay a few people to help me out. Without that help, I truly believe this site would cease to exist. 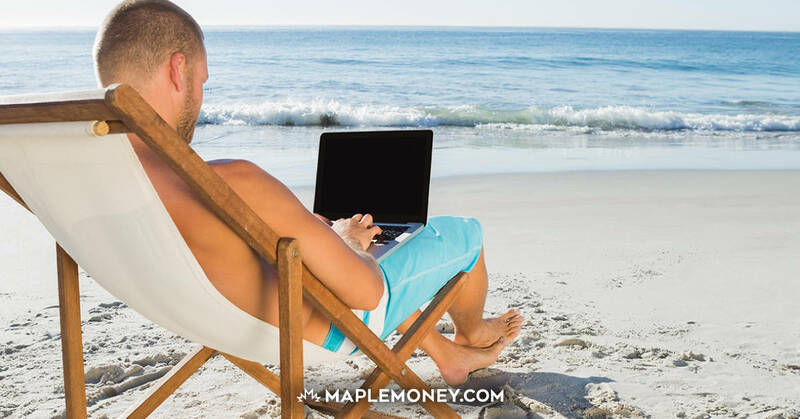 Because MapleMoney.com has grown so much over the past 7 years, I would not be able to handle the growth on my own. I would never sleep! Meeting one of my favourite bloggers, Kerry from Squawkfox. I’m one of those people that hates it when someone else doesn’t like them. When someone disagrees with me, or tells me I’m doing something wrong, or criticizes me for doing something they don’t believe is right, I get upset. That’s why I haven’t written much about making money blogging or creating an online business, because whenever something like that would come up here on the blog, there would always be at least one person who thought it was wrong that I made money with this site. So I kept my mouth shut. I didn’t say anything because I didn’t want to offend anyone or have it seem like I was bragging. Through encouragement from friends and family members, I’ve started sharing more personal stories with you, including those revolving around blogging and business, which are two passions of mine. And thankfully, the response has been nothing but positive. So thank you for that! I have no clue what the next 7 years of my life will bring, but I do know that I am going to use my days to the best of my ability. My awesome kids – Elliott (born in 2009) and Kaylee (born in 2012). I’m going to continue to share stories and tips and ideas that will help others. I’m going to continue to help people achieve their dreams. I’m going to continue to chase mine. I want you to know that no matter what is going on in your life right now – you can do big things. Don’t let anyone tell you any different. I highly recommend checking out the articles here if you want to make money blogging. I also created a page for Blogger Resources. This page shares a bunch of different websites, programs and books that may be helpful to you if you’re thinking of creating a blog (or already have one). People are ridiculous!!! You offer a FREE information site to anyone who wants to use it. I have saved a TON of money by looking at your website. You should be getting paid for it and i am HAPPY i do not need to pay for your services. Your site has saved me tonnes of money so it doesn’t bother me one bit that you are earning money for it. What you do is more than a full time job so why shouldn’t you get paid for it? It doesn’t cost your readers a cent either. Sorry that some people are so petty and rude (and perhaps jealous that they didn’t think of it first!) lol! Your blog is an inspiration! Keep up doing whatever you are doing!! Know that you cannot please everyone, but help a lot more than you disappoint. It’s hard to listen to toxic – you are better than them. Remember all that hard work you have put in to getting to where you are today. Love your blogs, posts, and tips. Thank you so much, Ana. That means a lot! I wondered what was going on when I stopped getting the daily emails, but I figured you might be having troubles, etc. Glad to see you are doing well 🙂 I have seen a few places where there always seems to be one that has to be a you know. Don’t worry about them, but I know that is easier said than done because I don’t like people upsetting me and take it to heart as well. (Another January-born lol). Anyway, keep up your work as long as you love it — we do! Thank you so very much, Linda. I appreciate your kind words. Sounds like us January babies are both sensitive! Ive been thinking about starting a blog and this is helping me think more and more about it. I haven’t decided what i want to talk about in my blog. But i would like to do it for fun. Ill make sure to read your series!